Spring has Sprung in Roscoe Nursery! 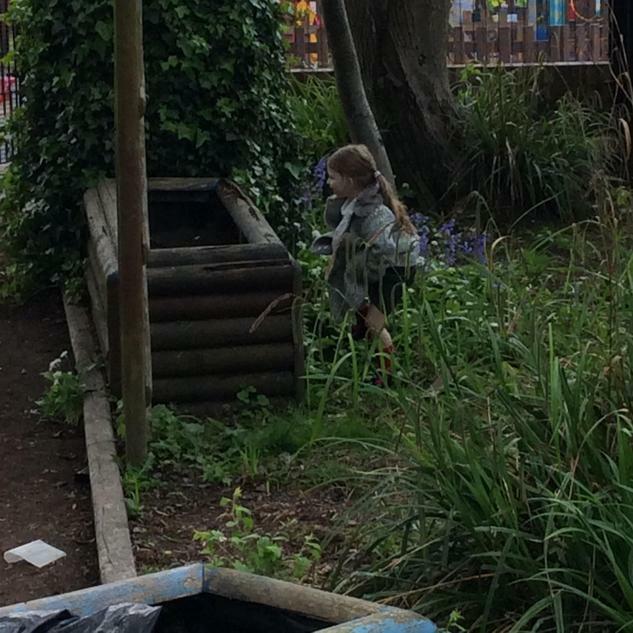 We have lots of visitors including chicks, tadpoles and caterpillars. The children are fasinated watching the new life grow and change. Understanding of the World- 'recognising similarities and differences, pattern and change' is a key area of our Early Years curriculum and the children are engaging in many opportunities to explore these in school. 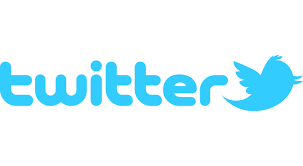 Please see the photos attached that we upload to our twitter page daily to keep up to date with whats going on in Nursery and the amazing things your children are learning and getting involved in. A huge welcome to our new families and our returning children. I am so excited to get the year started. I appreciate your patience regarding our staggered start for the Nursery and Reception children. We begin our year like this in order for the children to have a smooth and comfortable transition from home, previous nurseries and our Butterflies nursery. We want the very best for your little angels and we want to get to know them in small groups where we can give them our undivided attention and show them the areas of our classroom and demonstrate the routines of the day. 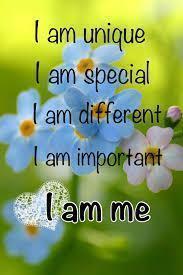 In this first term our theme will be 'I AM SPECIAL'. Through this theme the children will engage in many activities based on the following... 'My Home', 'My Family', 'Where I Live', 'My Body', 'My Friends' and 'Classroom Rules'. We kindly ask parents to send in a photo of your child's family so we can discuss and display in our home area. Please send a spare set of clothing for your child as we know little accidents can happen. Please let myself or Mrs Steadman know if we can help you with anything. Ernie made a great trail to balance. What would you like in Butterflies Cafe? Amara can find the rhyming pictures. We are back in school, the sun is out and we have new friends in Nursery. This term we are learning about growing through animals and plants. We are going to use the Wild Woods to explore changes in the environment with Mr Conqueror and transfer our potted plants into the large planters in the woods. Nursery are enjoying mark making and reading independently! We learned the names of some vegetables. The children made paper SUPERTATOS independently! THE FROST IS IN THE AIR!!! 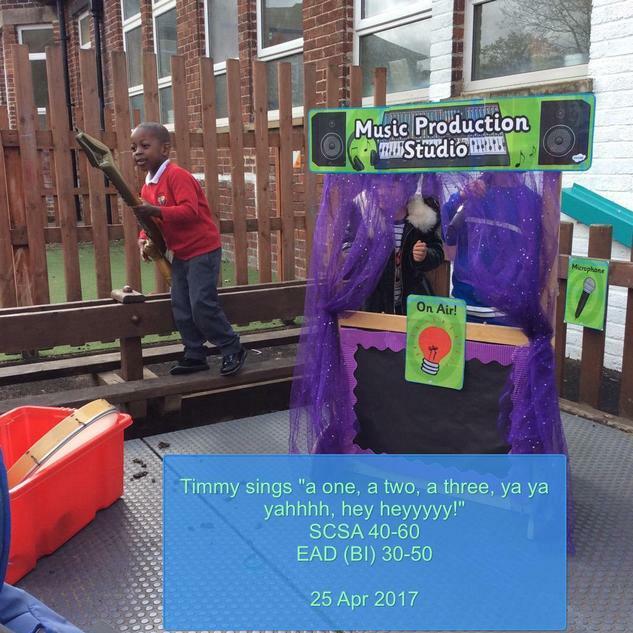 We have been learning a new song this week. The Frost is in the Air! 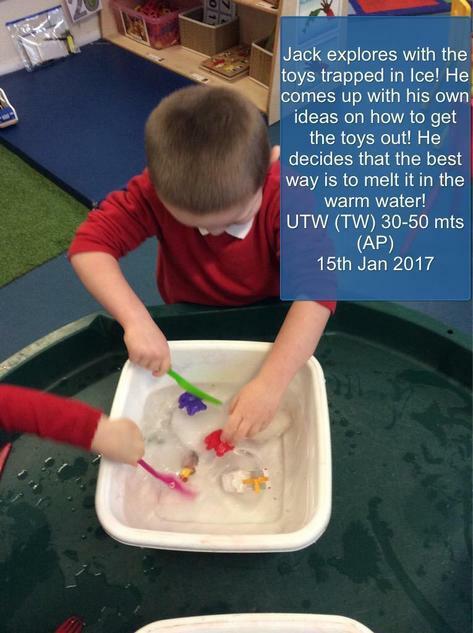 We came into nursery and our toys were trapped in ICE!!! We used our imaginations to find out what was the best way to get the toys out. We found out that warm water was the best way. The children chipped and rubbed and smashed the ice. Snowman counting was one of the children's favourite activities this week. They very carefully used the tweezers to pinch the cotton snowballs and match to the snowman cup. The children enjoyed exploring the frost and icy weather outside aswell. BRRRRRRRR! Happy New Year to all our wonderful families. We are back to school and working hard. We have been learning all about Winter in Nursery. 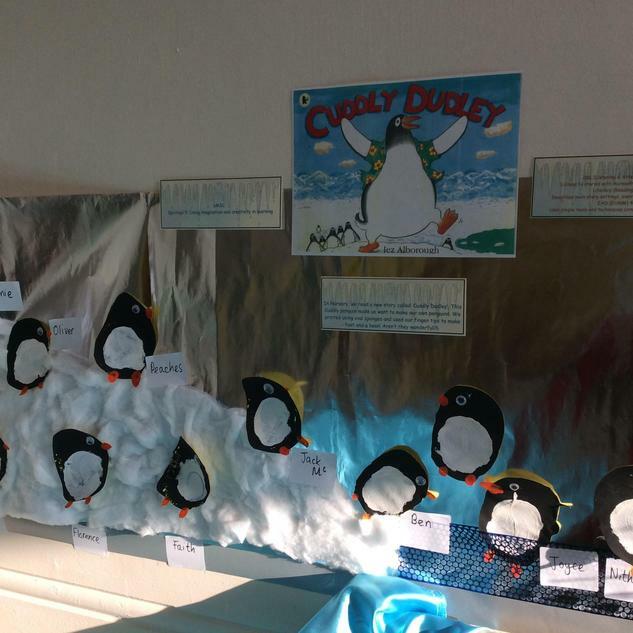 We read the story 'Cuddly Duddley' and made the cutest Penguin pictures. We have learned many new winter themed nursery rhymes and counting songs. Cutting purple prickles for the Gruffalos back! Start of Autumn Term 2 in Nursery and we are off to a flying start with Nursery Rhyme Week and Learning all about our new story 'The Gruffalo'. The children are learning about number and rhyme through singing and lots of different games. We are doing Dough Disco to help gain strength in our fingers ready to make marks and write and 'Squiggle while you wiggle' helps us dance with different moves helping our gross motor skills. We are still exploring the world around us watching how the seasons are changing and what is happening to our Wild Woods! On Friday 25th November, we are beginning our drop in sessions when you drop your child off at school. You are welcome in for half an hour to play with your child or share a story and choose their new home reading book :) I look forward to seeing as many of you as possible! Hello to all the old and new Nursery children and parents. 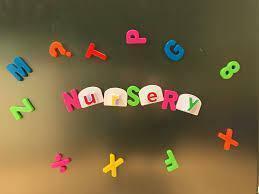 I am the Nursery teacher...MISS LOVE I have now met all the little stars and we have settled in well. 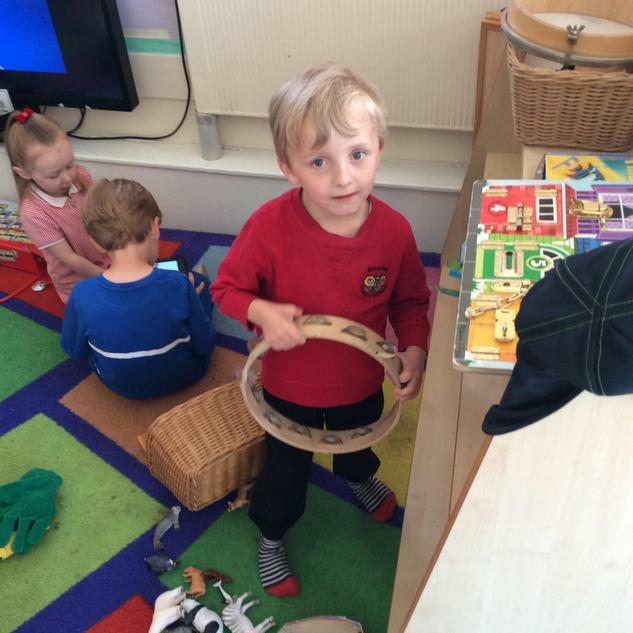 I am new to Roscoe too so I hope we can work together to provide the children with the best start to their school life. I am enthusiastic and passionate and aim to develop your children's confidence, learning and make them feel happy about coming to school. 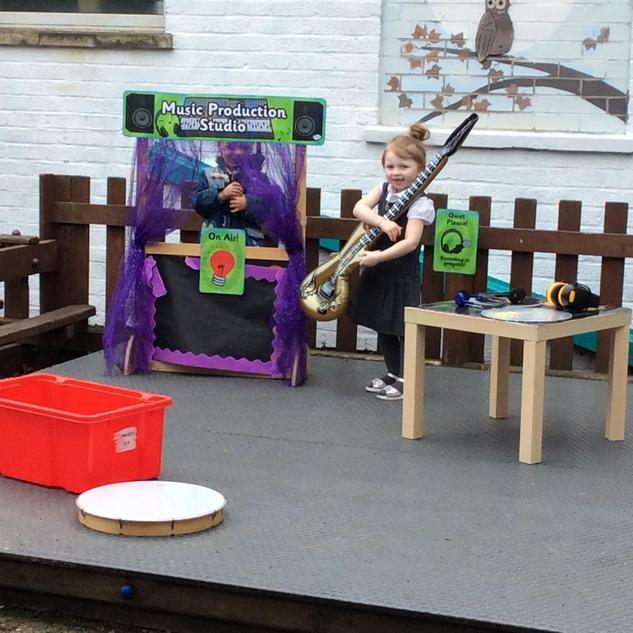 This week we have been getting to know the areas in our foundation stage unit, inside and outside. Reception have moved down and are now next door to the nursery. This way we can plan for all the children in the Early Years Foundation Stage to learn and grow along side each other. The Nursery children are also helped by their teaching assistants...Mrs Steadman and Mrs Dever. We have spent this week building lovely relationships with all of the children. I hope you all received the 'All About Me' task. If you have not, please let me know and I will get one to you. A little reminder for snack money...we would really appriciate your donation of £1 each week for a variety of snacks each day for the children. Please pass this to me on a Friday morning.